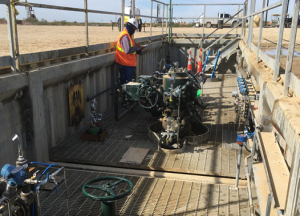 Our Downhole Monitoring capabilities enable artificial lift optimization and high-quality bottom-hole data for reservoir engineering. Provides a reliable means of collecting high-quality, real-time downhole pressure and temperature data. Direct and simple hookup to pump controllers, loggers, supervisory control and data acquisition (SCADA) systems, programmable logic controllers (PLC’s) and variable speed drives (VSDs). Eliminates the need for expensive proprietary surface equipment. Includes RTU Modbus and 4-20 mA communication outputs. Patented integrated Easy Connect pressure testable cable-head design allows direct connection to downhole instrumentation cable using metal-to-metal sealing technology. Gauge body constructed out of 316L stainless steel or Inconel 825 with Hastelloy diaphragm for corrosive applications. Fully welded construction ensures maximum protection against gas and fluid invasion. Multi-gauge. Up to 10 gauges, any combination of Piezoresistive or Quartz, can be connected to a single downhole tubing encapsulated cable (TEC). Smart Technology. In addition to recording and transmitting downhole pressure and temperature date, our gauges communicate critical data, including: device configuration, device health, downhole head voltage, current, calibration and downhole serial number identity. Field Programmable. Our gauges can be configured for single or multi gauge applications and work on long lengths of TEC, up to 50,000’. Quality Assurance. Each gauge and G6 gauge controller is IEC 61326 certified by LabTest Certification Inc.